Where we end up | Kate or Die! I have not updated Kate or Die in a long time, and it was sporadic before that. I still update on ComicsAlliance every other Monday and plan to continue to do so, but I keep yo-yoing on whether or not I actually want to keep working on these over here. It’s odd. So many of my older comics, I look at and feel uncomfortable with. I was young and new on the internet and nobody was watching, so I said whatever came to mind. Some of these strips I’m very proud of, others I could go and revise until they were barely recognizable. I’ve deleted a few. Some things are better left in their strange pockets of the internet where my credit’s undoubtedly been erased, anyhow. I stopped wanting to make personal comics awhile ago. When I reached a certain level, I had no control over where my comics went or who responded to them. I don’t mind this at all when it comes to the funny stuff or anything fictional – Bravest Warriors, Adventure Time, and now Power Up, etc – but when it’s really, really personal… it started to feel weird. I stopped wanting to be so open, I guess. I needed to keep some things for me. If you scroll back through these comics you can see me commenting about this, going back and forth on it, but this is where I am right now. I think if I come back to webcomics it’ll be through fictional ones, but I’m really enjoying writing right now. I get to talk about things through a veil, from both my perspective and others, to incorporate my experiences while building new worlds and characters. It feels a little safer and a lot more challenging, in a way, and I’m having a lot of fun. I never expected or set out to become a writer, but I really, really love it, and I want to keep going! Maybe it’s that life got better. I found somebody really wonderful and I’m about to move 3,000 miles away to be with him after fighting for my visa for 9 months. It’s been almost a year with him, and the funny thing is, I’m just not as angry anymore. 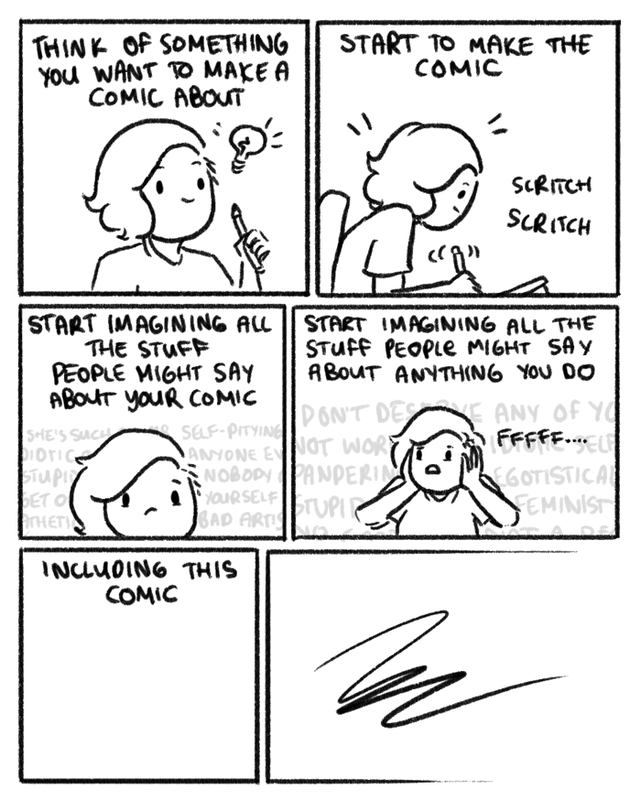 There are still things I want to talk about, but the fury that drove my comics in the beginning has kind of abated. He makes me excited, drives me, but now it’s to tell fun stories, adventure stories, things full of heart and joy. I know the feeling, when an artist you like gets happy and their work suffers. Bear with me. Life’s sure to kick me in the face eventually and all the dark stuff will pull itself by its tendrils back to the surface. Comics are how I cope. Until then, enjoy the archive. 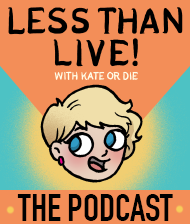 Check out Power Up and all the other fun things I’m working on, and keep your eyes on ComicsAlliance for Kate or Die. I have so many exciting things coming up in the next few months. Thank you for going through so much with me. I’m not done, just… shifting focus.